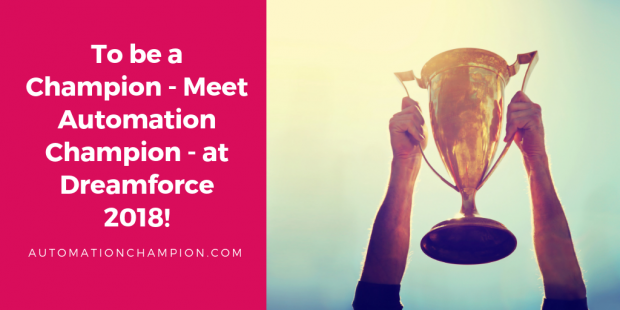 To be a Champion – Meet Automation Champion – at Dreamforce 2018! I am excited to be a fourth-time speaker at Dreamforce 2018 – September 25th – 28th. I will be presenting sessions at three sessions – (1) two @ Admin theater; and, another session on Small Business with Salesforce Essentials. My excitement is doubled knowing that, Dreamforce’18 offers varied opportunities to meet fellow Trailblazers from around the globe! I know many fellow Trailblazers through social media – and, I would like to meet everyone personally. Dreamforce provides a platform to solidify existing bonds and build new ones! Here are the details of my presentation including other activities – I hope it sounds interesting to you, and if you will be in person at Dreamforce 2018 then, please do bookmark following session(s) and come to meet me! Session Description: Building visual and dynamic apps has never been easier. Now you can build visual flow screens using Lightning Components in Lightning Flow. In this session, you’ll discover the power and versatility of components in Flows. You’ll leave knowing (1) how to use flow components that are bundled in; (2) how to install them from AppExchange; and, (3), last but not least, how to build and publish them with the community. Click here to bookmark my session! Session Description: Are you ready to take full advantage of the Lightning Experience? Yet, feeling uneasy about migrating your work? If so, then, this session is for you. You’ll learn (1) how to get more out of the platform by leveraging features like Lightning Experience and Flow; (2) how to create a guided selling experience; and, how to migrate URL buttons from Classic to Lightning. Session Description: Are you part of a small or mid-sized business that’s just getting started? In this informative session, we’ll talk about the latest and most efficient way of growing businesses to get started on the world’s #1 CRM – Salesforce Essentials. In addition to that, we will show you how your teams can deliver a top-notch customer experience. Find out how to put customers at the center of your business so you can sell (1) smarter; (2) keep your customers happy; and (3) grow faster than ever before. You’ll leave with tips and tricks from customer Trailblazers who’ve grown with Essentials. Apart from my sessions, you can find me at Admin Meadow around these times – at Flow or Process Automation booths. I hope you’re as excited for Dreamforce 2018 as I am – and, I hope to see you there! ← So You Think You’re Ready for Dreamforce 2018? Looking forward to see you at DF18.